Something isn't right there.. that's $319. The $199 one has a different (worse) display. $319 and import duty is not worth it. I can only suggest you check with Lucy via the e-mail address I posted. I think she is China based judging by the response times to UK time. I think the $319 you are referring to is Aussie dollars and not US from the website. The price I was quoted ($199) was defo USD and was via Lucy and e-mail and was for the 3 arm variant as I prefer that. I have noticed that the EcoWitt website sometimes chooses US pricing, Canadian or Aussie. I don't know why! $199 AUD equates to $142 USD. The WS-2000 goes for $270 on Amazon. There's no way they are selling that model for 199. That's the 199 version, with a low resolution display. OK I have confirmed that Ecowitt will supply the HP2550 TFT display console and 3 arm sensor package for $199USD. If you want to add the additional thermo/hydro sensors these are basically $10 each and you can have upto 8. They will ship the units configured to 433 or 800Mhz as you desire. On top of this though there is a $100USD courier cost. That does take the shine off it though if you work out the USD to GBP rate it is still favourable. The biggest risk will be if you get hit with VAT by customs which will add 20%. I am having a deliberation at the moment as I really want this kit just not sure I can afford to pull the trigger so close after Christmas! I asked about the hp2551 and was quoted 269.99 usd with shipping and I think you have to assume we'll have to pay vat and customs duty. That makes it a similar price to the same unit off the amazon US website I think I feel more comfortable ordering from amazon. what a shame nobody in the EU or UK stocks it. Yes, it is a shame, though again I believe that Ecowitt are considering selling via Amazon UK as they do in Canada/Australia and US. So you could wait if the import element puts you off. Personally I would not purchase the Ambient version simply because you may run into issues with the 915Mhz freq they use which is allocated to O2 and Vodafone for mobile phones in the UK. You will also be forced to import spares in the future (being realistic!) whereas if you go with European frequencies now you can always get spares when supply does become available. Good luck and I will be interested in how it goes with the Ambient kit. $100 for shipping?! I think that's the reason why the unit is $199.. that's insane! Ah to be fair to Ecowitt I am intending to get a boatload of additional sensors and the new weather sensor gateway so it will be quite a big and heavy package and they mentioned DHL so a reputable courier firm. I will wait for the local spring holidays to finish in China and then push the button so will order my kit mid Feb. 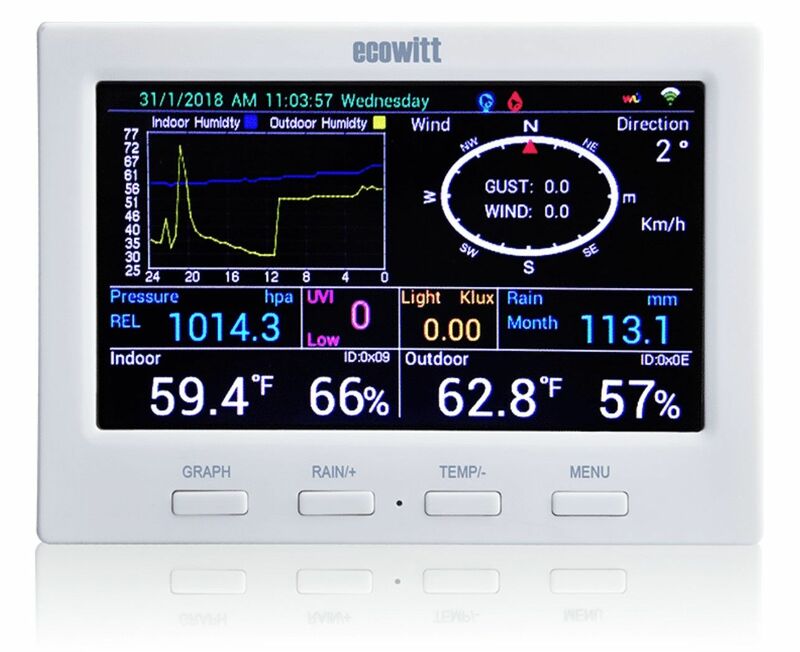 It will be interesting to see where Ecowitt go, but given they are actually Fine Offset, I am hoping that availability of their kit will improve. They seem to have lots of good ideas and new kit coming. It all of course depends on your budget, but there are several good options reviewed at WxObservation, ranging from ~$100 to ~$500. If you're concerned with the frequency, I recommend the AcuRite Altas, which is 433 MHz. If you can't afford that Atlas, they also make the 01012M model that will connect to the cloud for less money. Info on these and the Ambient weather stations can be found at the link above. Good luck! I ordered the ecowitt wifi gateway soil moisture and air quality sensors from amazon.com to test the international shipping option they shipped on the 4th and arrived today (8th) no problems with customs or vat. I hope every order is that fast and easy because now I have to decide if I get the ambient weather or the acurite station now I know the shipping thing works. The sensors seem to work great, setup was easy and the data looks accurate the only bad thing so far is the usb powered wifi gateway it just plugs into a usb port, so it just sticks out of the side of the pc until I can find a power supply or usb extension lead for it. The data uploads to ecowitt.net and an app on my phone. Glad to hear that worked out OK. I too have committed though this time direct to Ecowitt/Fine Offset in China. The new Gw-1000 and the soil sensor and PM2.5 sensor as well. All set to UK frequencies. They wont start work again until Monday after the New year celebrations so I don't know how long they will take to ship but it was going to be DHL so hopefully fairly swift. As for Customs/VAT, I guess we will see. Once I have it up and running I will share a review. As a follow up to my post above , I have received a follow up email from ecowitt amazon.com asking if the order had arrived ok and informing me an updated firmware is available. The interesting point is it was signed by Lucy, so it appears Lucy is the point of contact for the amazon US webstore and ecowitt direct. That's good. I have to say that Lucy seems to be the main customer service person. She is the contact I have been corresponding with for some time when I started asking Fine Offset about kit availability. I am curious about your acquisition. What frequency did it arrive set to or did they ask before it was sent to you? it's 915mhz there was no choice. It's just US stock sent to the UK. That said I have purchased 915mhz kit from UK outlets in the past. Hi Trebor, you might want to be careful with your mobile phone around the station then as Vodafone/O2 mobile signal overlaps the 915Mhz band and you could lose data. I have suggested that Ecowitt might want to consider having Euro spec frequency kit available to order via Amazon.com global store. As for Lucy, I would concur. I believe that there is only one very busy Lucy as among the very many e-mails we have shared the writing style is always consistent. BTW. Love your photography. What telescope do you use to capture those images. Just beginning to dabble here but then again I don't have the luxury of the dark skies you have. It would be simpler to put uk spec on amazon uk avoiding the vat issue. I have not noticed any issues with frequency it's such a low power thing and the parts need to be close together, maybe I'll try making a call standing next to it and see what happens. The pictures are taken with all sorts of equipment from wide angle lenses up to an 8 inch celestron cassegrain with either a webcam or dslr attached. Lucy has emailed me back to say that I can buy a UK spec HP2551 for 275USD including shipping via DHL. Sounds pretty good to me. What are the pros/cons of the 2550 vs 2551? P.S. Lucy may not be a real name; we had a call centre in India that allocated themselves British names to help foreign customers! I am not sure there are much in the way of any. As far as I can tell with my discussions with Lucy is that the 2550 is using the tri wing all in one sensor (aka like the Ambient version) and the HP2501 is using a bi- arm version. I believe that the sensors within the package are the same just orientated different. I am still awaiting for my HP2550 to be shipped. Don't forget to specify the frequency you want it set to and if you want any additional internal thermos/hygro sensors although in theory you could order those from Froggitt later if you choose 866Mhz. For completeness I have ordered a bunch to be included from Ecowitt/Fine Offset. The major upside of ordering from Ecowitt is that they will configure and test it all before they ship it to you unlike a box shifter like Maplin used to. The downside is that there is a delay from order to shipping. I am hoping my kit will ship next week which is 2 weeks from order point. Just setting expectations! She priced for 433Mhz. Looking at the froggit website it has a mix of 866 and 434 stuff, not sure which is compatible! Tricky! I have Evohome as well though I am pretty sure they should all live in harmony! If in doubt just order it from Ecowitt, as the US$ prices seem pretty competitive even if you do have to pay for shipping which is not so cheap. My aim is to try and get this stuff imported before the 31/3/19 when goodness knows what will happen to our borders! If all goes well I am reasonably sure I will be adding additional Ecowitt sensors going forward. I see. I thought you were going to purchase from ecowitt?